Villanova’s Mikal Bridges shoots over DePaul’s Paul Reed. The skills that Mikal Bridges has developed over the last seven years — his defensive prowess, moving without the basketball, his ability to knock down a three-point shot or drive to the hoop for an emphatic dunk — are about to make him a certain lottery pick in the next NBA draft. However, his coaches during that time, both at Great Valley High School in Malvern and at Villanova, will tell you there's more to Bridges than talent alone. It's being a good teammate in his dedication to working within the framework of the team. It's his attention to detail and preparation. It's taking coaching without complaint and always striving to improve. In the view of Jay Wright, "he's humble and coachable." "It's probably his intelligence and his patience, to be smart enough to understand that his path to being a great player was going to take some natural physical maturity," the Wildcats coach said. "It's getting bigger and stronger. It's a mental maturity. It was going to be natural. You just couldn't do it in a year. You couldn't do it in two years. "It's having the intelligence to enjoy that process. He never rushed it. He never complained. He just kept getting better in every phase. I'm really proud of him, and I'm impressed." Bridges' coach at Great Valley, Jim Nolan, said he would describe the player as "coachable, coachable, coachable." "He was a good teammate and a good leader, but he was coachable and a good decision-maker," Nolan said. "In our program, we get on kids. I get on kids. It's about focus and concentration, doing the right thing. There were no special cases, and that included Mikal. But he always gave that effort and did what we asked him to do. He did the things necessary to be successful. Plus, he's a great character guy." The 6-foot-7 Bridges likely is entering the home stretch of a college career in which he has become, in his redshirt junior season, one of the top 10 or 15 players in the country. After Wednesday night's overtime win at Seton Hall, in which he led the Wildcats with 23 points, he is second on the team in scoring with a 17.4-point average and first in three-point baskets with 73. Entering the Georgetown game, he was shooting 50.7 percent from the floor, 41.7 percent from the three-point arc, and 83.7 percent on free throws. Combine his shooting efficiency, range and ability to get out in transition with the quickness, long arms and intelligence he exhibits on defense (a team-high 1.7 steals per game), it's no wonder NBA teams covet him. Mikal Bridges, left, going after a loose ball during a game against Providence. Recent NBA mock drafts have shown him to be going anywhere from No. 8 to 11 in the first round. Bridges has one more year of eligibility but Wright has joked more than once, "If he's going to be picked that high, I'm booting him out of here." "It's his versatility," he said. "He can guard anybody, any position. He can shoot threes. He can handle the ball. We've watched gradual progress in him every year. I think what the scouts see is if he keeps improving at that rate, we could have something special." But the NBA is not something Bridges thinks about, at least in public. "There's no thinking ahead during the regular season to the draft or to next week's game," he said. "It's all about getting better every day and preparing for each opponent that's coming up. I don't think about any of this draft stuff at all. It's not going to be helpful for my teammates. "Obviously friends will tell me some stuff, but if your mind's the right way, then it won't affect you and you won't think about it that much." Mikal Bridges of Great Valley going after a rebound with Chester’s Rondae Jefferson, left, in March 2012. Bridges' basketball story began before his sophomore year at Great Valley. He grew serious about the sport after a growth spurt of three inches to 6-6 and focused on what he needed to do to develop his skills and gain knowledge about the game. His objective was to be an all-around team player at both ends of the court. Nolan worked with him in understanding the game more, "helped me a lot with moving without the ball, passing and cutting, knowing a lot about the game that helped me out," Bridges said. Nolan said Bridges' work ethic grew. "He was always there — on time to practice, giving a little bit more of an effort after practice, coming early, wanting to get in the gym in the offseason," he said. The other Great Valley players appreciated him. Ryan Buchholz, now a defensive end at Penn State, called him "a great teammate on and off the court." "On the court, he's not going to yell at you. He's not going to put you down if you mess up," Buchholz said. "He's always going to bring you back up. I always see that now when I'm watching their games. I always see him with a lot of energy. I always see him helping his teammates out." Bridges began attracting much college interest during his junior season. Nolan estimated he already had 18 to 20 offers, including strong interest from St. Joseph's, by the time Villanova got involved. Bridges said he already liked the Wildcats, and the fact that assistant coach Ashley Howard had recruited him for Xavier before Howard took a job on Wright's staff helped influence his decision. Another major step in Bridges' development came after he arrived on campus. Although Wright liked the way he played that summer, he chose to redshirt Bridges because the player needed to get stronger and because he wouldn't turn 18 until around the start of fall semester classes. "I don't know of a kid would wouldn't want to play at this level right away," Bridges said. "But the redshirt idea made sense for me and my family. I was young for my grade, too. So I stuck with it for the year and kept improving, getting better and stronger." Bridges made an impact in his first season of competition as someone who could play the point in Villanova's 1-2-2 zone press, a role he has stayed with. He made strong contributions throughout the season, but none as important as his five steals and clutch defense down the stretch in the win over Kansas that got the Wildcats to the Final Four and the eventual 2016 national championship. 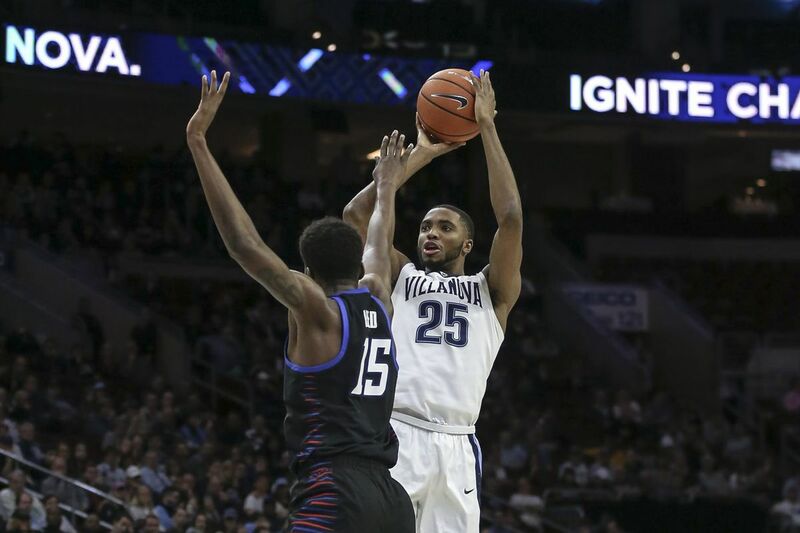 As a sophomore, with another year of playing with Josh Hart and Kris Jenkins, Bridges became more confident in his offensive game, working on his shot and making the right plays. He also grew as a leader, learning from Hart and Jenkins, "watching how they did things and helping me get to where I'm at right now." And that place is a pretty good one. Those who have followed Bridges from the beginning look forward to seeing where that takes him. "I think it's pretty crazy that you could say I'm really good friends with someone who's going to be a top-10, top-15 pick in the NBA draft," Buchholz said. "I'm just excited for him," Nolan said. "It's exciting to have coached a player and been around a player who goes that far. And a national champion, too."